Bird enthusiasts of all levels will attract more of the birds they want to see with Wild Delight Woodpecker Nuthatch and Chickadee Bird Food. This unique mix of six delicious seeds and five irresistible fruits is blended to attract the most desirable outdoor pets. 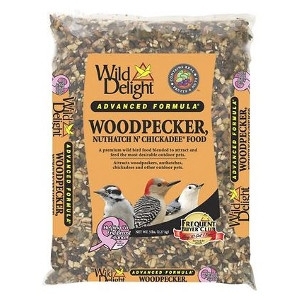 Like all Wild Delight bird seeds, Woodpecker Nuthatch and Chickadee Bird Food is fortified with the essential vitamins, minerals, electrolytes and amino acids that wild birds need. It’s also free of chemical preservatives so you can feel good about offering it to the wildlife visiting your yard.